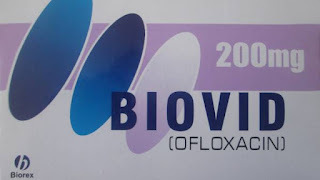 Biovid contains ofloxacin, which is an antibiotic agent active against germ-positive and germ-negative bacteria. Biovid works in urinary tract infection (UTI), respiratory tract infection (RTI), skin and tissue infection, enteric fever, non gonococcal urethritis, infection in bones and joints etc. It is also used to treat eye infection. Side effects: Some common effects include gastric discomfort, nausea and anorexia, diarrhea, allergic and neurological. Precaution: Hypertension patients should not take this medicine and keep medicines out of the reach of children.